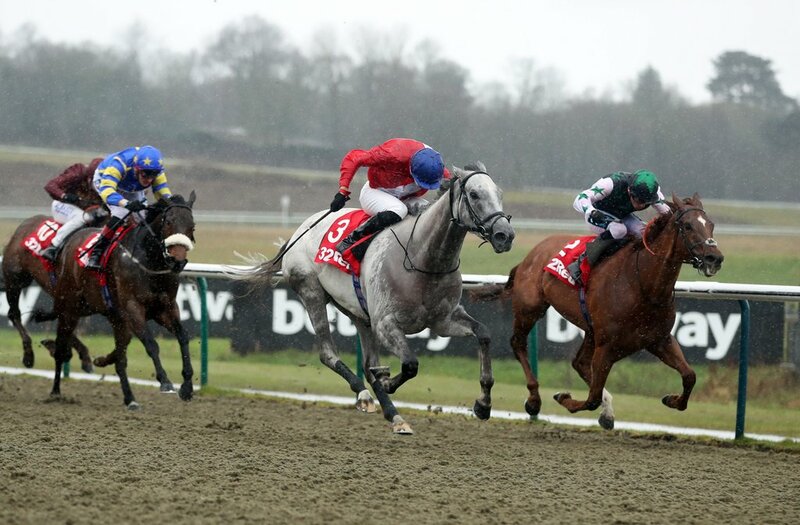 John Gosden's Wissahickon is clearly the star attraction this Good Friday, as the All-weather finals take centre stage at Lingfield Park. The four-year-old will bid for a fourth successive victory on the polytrack when he comes up against familiar rivals in the Betway Easter Classic over ten furlongs. After landing the Winter Derby seven weeks ago, there were claims from connections of the horse that he could compete internationally at Dubai's World Cup meeting, but that will have to wait until next year. Still, it looks an exciting year ahead for the son of Tapit, who will surely she bound for a return to the turf after this contest. Kachy will surely be another strong fancy on the day [along with Wissahickon] for punters, given his incredible form on the artificial surface. He was a runaway winner here in the Listed Cleves Stakes back in February, and posted a record time over six furlongs on the day. Simply not for 'katching', he returned after a short layoff to win by six widening lengths at Wolverhampton on Boxing Day, meaning his last five appearances on the all-weather has merited four wins. Aside from bumping into Battaash and Blue Point last year, he has an outstanding record as a sprinter, and is another shorty on the day who looks near impossible to stop - if on top form. Lion Hearted will bid to become the Champion 'Winning Most Horse', if successfully making it eight wins on the all-weather since joining Michael Appleby. With Executive Force and Matterhorn both sat on six victories, a win in the Sun Racing All-Weather Championships Apprentice Handicap for the five-year-old will ensure he cannot be caught, and will prove what a fine purchase he has been for the Slipstream Racing syndicate. After disappointing as the even-money favourite at Southwell back in March - which ended a run of five on the bounce, he got his head back in front twice at Chelmsford - most recently in a useful handicap over seven just last week. Ready to end the winter in style. Away from the All-weather, the impressive Outbox makes his return to the scene in the Queen's Cup Stakes at Musselburgh. This son of Frankel was a perfect three out of three as a three-year-old, and will hope to add a fourth career success on his first start as a four-year-old. Victories in novice events at Leicester and Ffos Las over a mile-and-a-half prompted a step up in trip, where he took all the honours in a Conditions at Newbury back in October. He beat Elegiac - who won on his turf comeback just last week in a Listed race at Nottingham, and Aspetar who finished second to Marmelo in a Group Three at Newbury on Saturday. Form stacks up, and Outbox will be ready to continue his fine progression. Paul Midgley has a fine group of sprinters in his yard, and sent as many as four to the Sprint Trophy Conditions Stakes at Musselburgh at the beginning of the month. The one who prevailed? - Tanasoq; last year's winner of the Epsom Dash at the Derby meeting - which was part of a four-timer for the now six-year-old, will look to follow that return run up in the Scottish Sprint Cup Handicap at the same venue this weekend. His form did tail off towards the end of last year, but maybe was feeling the effects of a lot of quick-fire runs. The absolute minimum of five furlongs is exactly what he wants, and the son of Acclamation will be a leading fancy going into the weekend.